2. Slice zucchini in half lengthwise and lay the flat side on the cutting board. 3. Then cut in half longitudinally again and those pieces in half one more time. 4. Take all those pieces and cut in half horizontally. 5. If you need clarification, see pictures. 6. In a shallow dish, crack egg and scramble. 9. In a separate shallow dish, add panko, garlic, onion, paprika, Parmesan cheese, pepper. 11. Spray a baking sheet with olive oil cooking spray. Coat it well. 12. Coast zucchini in egg mixture. 13. 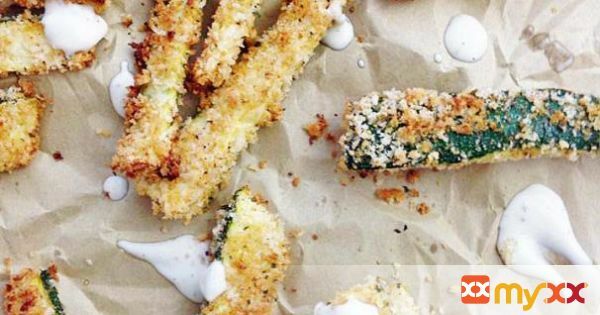 Dip off excess and coat in panko mixtures, pressing the panko onto the sides of the zucchini. 14. Gently place on baking sheet. 15. Repeat for all zucchini pieces. 16. Once all zucchini is on tray, spray the tops with olive oil cooking spray.Cook for 10 minutes. 17. Flip pieces over and cook for another 10. 18. Remove from oven, serve immediately with ranch dressing for dip.